Refusing the worn out formulas of current mainstream trends in favor of making the most genuine music possible is no easy task in today's often uninspiring music market. Hailing from Youngstown, Ohio, Asleep is a band that has lived this statement to the fullest building a strong industry and regional buzz with the strength of their first two-disc release "All These Things We'll Never Need" (Fractured Transmitter). Set to a conceptual theme, the album is somewhat of a throw-back to the experimental classic rock sounds of the sixties and seventies while still overflowing with pop hooks and marketing sensibility. The band is truly a melting pot of musical genres that has been captivating audiences across several states with their cinematic and energetic live show. 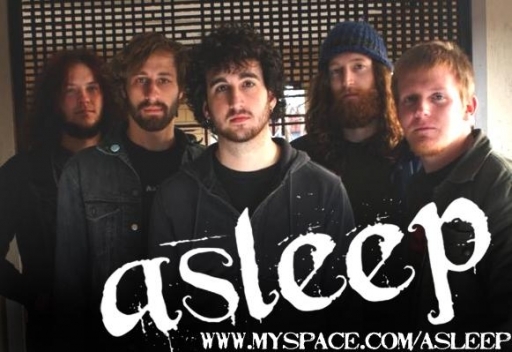 The members of Asleep are no strangers to performing to large crowds having supported numerous major-touring acts such as Hawthorne Heights, Motley Crue, Three Days Grace, Kill Hannah, The Exies, Smile Empty Soul, Trapt, Mushroomhead, Flaw, Deftones, and Strata to name a few. Essential listening for those thinking outside of the box, Asleep wishes to prove they can stand out among the current oversaturated modern rock and alternative formats as something just different enough to capture the attention of all ears they come across.